Are you frustrated with your golf in the real world but still love the game. Well finally, here is a game that is sure to satisfy all those budding or not-so budding golfers out there. 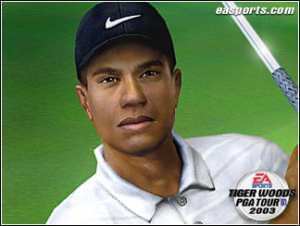 Tiger Woods PGA Tour Golf is a game where you can leave your worries behind and take to the links of the world�s most prestigious courses. There is PBC Pebblegrass, St Andrews just to name a few. Along with the more well known courses there are a few fantasy courses to spice things up. These range from courses in front of a castle, to playing in front of a waterfall. If you want to see what the graphics chip can do on the Xbox put this into the drive and I am sure to you will be pleasantly surprised as this is one sweet looking game. The visuals are crisp and clear which is a rarity for games for this console (for any console for that matter). The character models look incredibly life like. Of the 116 million polygons that the Xbox can handle I would say 99.9 per cent of this power is put into the characters models. The way this is deduced is the spectators, squirrels and birds look very blocky up close. This is a result of not having enough power left over to accommodate a more realistic polygon models. Luckily these parts are rarely seen up close and do not seem to interfere with the look of the game. The characters that you play with and against are quite consistently of a high standard. A good example of the animation using these models can be seen at the title screen. Which act as a good primer for what lies ahead. Some of the animation on the ladies rival even Dead or Alive Beach volleyball lusty visuals. In this reviewers opinion though, if you get a kick out of cyber ladies its probably time you took a shower (preferably a cold one). There are a range of special effects as well. Like when you hit a long drive, the camera will zoom around the player to dramatise the stroke. Other ones to mention are snap shots of the start, middle and end of your shot. All these effects are extremely cool and add to the excitement of playing. The in game graphics are even better than the FMV scenes that you will see when you first begin a tournament. Having played the same game on the PC I can say the graphics, while not being as crisp as what a monitor can produce, are of an even higher standard. When the game is loaded up there are a variety of options that can be chosen to play the game. There is the �play now� option where you are put straight into the game with a default course namely being PBC Pebblegrass. You will only play a few holes in this option. Once finished you will be put straight back to the main menu. To actually play a proper tournament you will have to go through a very enjoyable tutorial where tiger is used as demonstration for each shot. Basic controls are shown first until the more specialised shots are previewed. The other play modes on offer are also of high quality and these include: Match play, Skillzone, Speed golf and Scenario. Match play is the standard where you will play to unlock golfers and Tiger�s dream 18. There are a variety of golfers to witness, these include all the stock standard golf pros including Tiger Woods, Charles Howlle the 3rd and our very own David Appleby. Other than the more famous line-up there are fictional characters to keep things interesting. Such as a retired Sumo wrestler, the odd female femme fatale and a few other comical stereotypes. Skillzone is to hone your skills in aiming the ball. Targets are placed on the ground in different areas, where you must aim to get the ball in the centre for maximum points. For players with beefed up power meters there is also the odd moving target for extra points. These are a bit of a Lottery as the only way to hit these is with a driver and the shot has to be timed perfectly to hit any of these. Speed golf can be played with a computer opponent or a friend. This is a race to sink the ball in a number of different holes in the quickest time possible. The screen is divided in two and extra points are awarded for accuracy, speed, closest to pin and lowest amount of shots. The player has to run to his/her ball as soon as the shot is made which makes for a tighter game. This is a great way to make enemies or create hilarity depending on your disposition. The final option is Scenario where you are placed in tight spots and put under pressure to perform. For example you are placed in a tournament where the first 9 holes were played poorly and you will have to work hard to regain the lead. 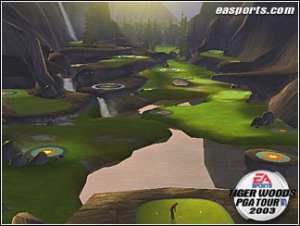 Other scenarios include playing in windy conditions and trying to score birdies on a set of par threes. These options are good fun and add variety to what could end up just a white-knuckle tournament after tournament. To add to the already long list of features there is the opportunity to win cash, which you can use to spend on upgrading your skills. Skills that can be improved are power, accuracy, spin, approach, recovery, putting and last but not least luck. Money is also awarded to you when you first switch on the machine. This happens if you have played other Electronic Arts titles. The more you have played these games the more cash you will be designated at the beginning. This is yet another bonus for hard-core gamers. The way the shots are executed are unique for this sort of game. Gone are the power metres and swing bars of yesteryear and now the path is made clear for the method of using the analogue stick for swinging the club. Put simply, pull back for the backswing and push forward for the downswing. Draw and fade are executed by giving the swing a slight left and right deviation. The strength of the shot is determined by how much backswing is used to hit the ball and how long the club is held in its uppermost position. This is crucial for the longer drives but not so much for the approaching shots. There is the added bonus facility in the control method to tapping the white button on the backswing for an extra power boost and pressing the black button after striking the ball to increment spin to the shot. Other parts that are included in this game such as sound are done extremely well if not a bit repetitive. There are birds chirping, airplanes flying above, spectators reacting to every shot that you make and even commentary to enrich your playing experience. There is even the sound of the Loch Ness monster in one of the fantasy courses. These sound effects add a great ambience and really come together well to synthesise the real-life experience. The commentary is funny and is a welcome addition to the next generation of Golf games. Comments such as when the ball hits a bunker �Did you bring your sunscreen� come to mind as one of the more witty remarks. With this many play modes and future enhancements to be downloaded from Xbox live. There is not much to say to fault this game. If there is one gripe it would be the putting which luck has to be relied on to make an accurate stroke. At the beginning of these shots there is a guide to show where the ball will roll if the ball is aimed straight at the hole. This guide is in the form of a broken white line prevailing the ball. It is up to you where you will aim the putt keeping in mind where the guide was on the default setting. The type of gamer that would get the most out of this game would obviously be golf enthusiasts but there is enough here to recommend to any gamer. With so many excellent features and with the pre-imminent Xbox Live looming in the distance there is not a lot to fault this title.